Previously I discussed the importance of family dinners. There are many challenges to this family ritual, but none are more frustrating then Picky Eaters. Thus, I am dedicating this entire blog to this matter. Let’s start from the Beginning and move to Teens. Much research and personal experience indicates that habits formed in the Early years continue into the Teen years. (slightly scary). One of my favorite bloggers had one simple message “Do not start and/or endorse habits that you don’t plan on following thru in the long run.” Excellent parenting advice. Simple and true. Tough to follow in the midst of crying and whining children. At this point solid food introduction is on its way. I am a huge proponent of fruits and veggies, and less inclined to suggest cereals for babies. When training taste buds, why start with processed flakes in a box? Why not go for the good stuff, fruits and veggies. 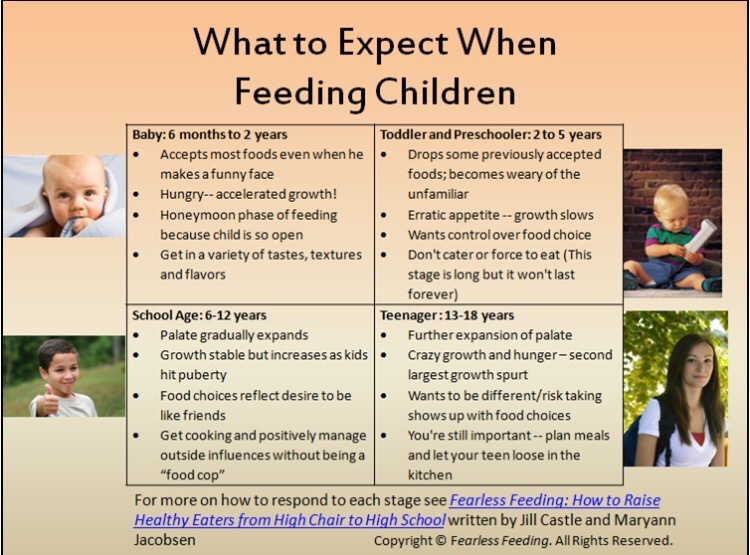 By 6months, we encourage all parents to offer babies all foods except Milk and Honey. Everything: fruits, veggies, eggs, fish, meat, peanut butter, cheese, yogurt, etc. At this point in the feeding journey, I suggest babies to sit in a high chair with parents at the dinner table. The dinner prepared at home for parents can be put in a bullet, vitamix, or ninja and pureed for little gums. This way, babies taste the salt and spices at the family table and begin the transition to real food. Leave food chunkier as kids age and more teeth emerge. 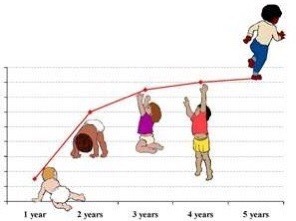 Growth during toddler years slows down. In the first year of life kids double, triple their birth weight. They are hungry for foods, ready to try anything, excited by all things. And then they turn 15months old and they chuck food on the floor, refuse to eat anything that is not white (bread, banana, apple sauce, toast, and pasta). Frustration rises through the house. Looking at this chart we understand that there are days when toddlers do not grow and need only a few calories to live – these are the days I term “eating air”. They take a few bites or none and the rest of the food is used as missile launchers. Great fun!!! Then there are the days where they grow a ton and they need tons of calories, so they eat great. Parents rejoice. This is short lived however, one to two days, and then this is followed by “all food is poison” days. Parents stress. Mistakes: They happen here due to fear of child malnutrition, child night waking from hunger, parental guilt, fear of dehydration, fear of being judged by grandparents, etc. Based on fear and no other fact, parents start offering crackers, gold fish, yogurt, or other white foods just to make sure the kids eat something. And the toddler scarfs down the junk, parents rejoice. Hmmmmm……. Hold it!!! Fact: When kids are not hungry, they don’t eat what is served. But they will eat garbage all day, any day. 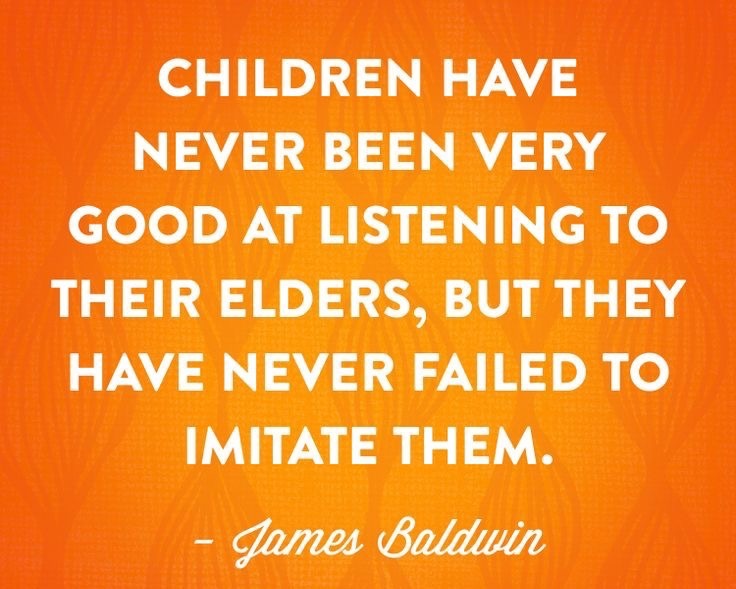 Adults follow the same path. Allow me to illustrate. After eating a full lunch, an adult wonders through the break room and sees a box of doughnuts. He takes one and eats it. He is not hungry but it looks delicious. Same with kids. Moral of the story: just because a toddler refuses fruits/veggies/protein but eats crackers or cereal, is not an indication of hunger. It is only an indication that they will take a cracker any time. Result: If this pattern continues, the toddler (who is smarter they you think) begins to associate not eating his food with the right to get anything he pleases. This is when picky eating develops. So all of a sudden, dinner becomes a buffet service. Who wants to do that at dinner time every night?? This is what should be feared, the buffet service, not the toddler. Be careful with snacks before dinner. There are so many snack times we don’t even notice because they have become background noise. Ex: snacks before getting picked up from day care or grandma’s house (which can be within 2hrs of dinner), crackers while shopping for dinner items, sampling food at grocery store, nibbles in the car, older sibling sneaking goodies to a younger sibling, etc. Snacks don’t always appear as crackers, it can be milk, juice, yogurt, etc. I would love it if all snacks would be a fruit/veggie/protein, but in the real world this is not the case majority of the time. When you start paying attention to the snack culture in your house, you will discover interesting things. This is actually one of the main reasons, toddlers and kids who “eat nothing” are at an unhealthy weight. Calories have to come from somewhere, and they do. Toddlers need to sit at the table. No roaming around with food. If they take a few bites and then they need to do a lap before returning to the table, so be it. They have the attention span of a goldfish. But food and drink are at the table only. NO TV. NO iPads. NO Electronics at the table. A common misconception is that distraction equals better eating. Nope. Studies done on this exact topic show that kids who eat with the electronics off eat more veggies then those indulging in screen time at dinner. They need to be served the same dinner as the parents with appropriate portion size. Portion size is 1 Tablespoon per year of age. So an 18month old should get 1.5T of chicken, 1.5T of mashed potatoes, 1.5 T of green peas. Glass of milk or water. If a toddler eats before parents get home from work, use leftovers from the night before as their meal. Do not give them a hot dog and tater tots because they have to eat early. So many times, parents eat amazing meals such as salmon, roasted potatoes, salad or baked veggies, and the kids get processed nuggets and mac and cheese from a box. Can anyone see the problem here? When they choose not to eat, they are excused from the table. No snacks later, NONE. Serve a family meal that may not be liked with a side of fruit or veggies that are a sure thing. Do not cater and prepare only what the children will eat. Create a healthy meal for yourself and have a side of fruit or veggie for the questionable nights. This way all the food is presented on the table from the beginning, and no one is getting up to get something else when the child refuses to eat the meal. Every time a parent gets up to get the child another option to eat, the child learns that it pays not to eat what’s in front of her. And so Parent Training Begins. Toddler body growth may slow down, but brain growth is at its peak. For a brain to develop properly, it needs good wholesome nutrition. So the food you are serving them now, will impact how they do in elementary school. Processed food at this age is a thing to fear. There is a strong link between food and disorders of childhood and adolescence. Many of you have wondered about the “over diagnosis” of ADHD in school children. How many of you have contemplated the over indulgence of processed foods in toddler years as the root cause of the rise of ADHD in school kids?? How about anxiety, behavior issues, asthma, eczema, etc?? Yes there are genetic components and environmental factors, but diet is a critical element for brain and body development. Fear easy processed foods. Respect is a huge thing. Children must sit at the table and show respect at all times. Do not tolerate “I hate this”, “This is Disgusting”, “Gross”, I am not eating this”, etc. As all who prepare dinner know, it takes a lot of thinking and planning to created the dinner meal. Do Not Allow Disrespect at your table. If rude words are uttered, the child should be immediately excused from the table and they can get ready for bed. No snacks, no milk, nothing. I promise you, this will only happen 1-2 times. The message will be very clear without words needed. I have had to implement this in my house for two individuals, ONCE. Message received by ALL. It was hard. I wanted to cry. I was worried that the two characters in question would starve to death (its only 10hrs to breakfast, all is ok). I do not tolerate impoliteness when I have worked so hard for the wellbeing of my family. Have kids help with shopping – they should be able to pick veggies and fruits at the store. You can do the color game, the alphabet game, etc. Keep a bag for items that are horrid and you have to return at the checkout. Kids can choose peppers, cucumbers, carrots, oranges, apples, potatoes, etc. You can be excited at their effort and teach them how to pick fruits and veggies to your liking. I have done it for so long, that now I sent my 3 kids in different directions to choose one item at a time, and my shopping time is cut down by 25%. Bottom Line: have them touch the veggies and be responsible for getting the family’s food. If you have the time, energy, and space to grow a veggie garden, go for it. Many studies link improved childhood eating with home grown veggie gardens. Depending on your child’s age, there are various ways they can help in the kitchen: Cooking with Kids. They can wash veggies, peel fruits/veggies, cut up veggies, mix salads with washed bare hands, mix veggies for roasting, arrange veggies for roasting. Kids who help in the kitchen eat a more varied diet then those who don’t. Yep, a study done on this as well. Serving veggies first on the plate before the meal increases veggie consumption by 40%. Never make the child finish what is on the plate and never force feed children. It is the parents job to create What the meal is, When the meal is eaten, and Where the meal is eaten. It is the child’s decision on How Much. Family meals are a critical lesson for picky eaters. Sitting at the table and not talking about food, but talking about your day, teaches kids of all ages what to eat, how to eat, and when to eat, in addition to all the other things learned in my previous blog on The Family Dinner. Children learn to like fruits/veggies/proteins by watching others enjoy their food. It’s not a quick lesson, but an important one. Having said that, there are kids with oral sensory aversion, sensory integration issues, and true pathology to eating. Check out this blog to understand the difference Picky Eater or Problem Eater. Theses topics need to be addressed with the pediatrician and appropriate referrals need to be made. The sooner therapist are involved with children’s behavior/eating issues, the more likelihood they can be corrected. It is critical to teenager’s well being that they sit down for a family meal. Bringing back the Family Dinner has an in-depth look at how this family ritual helps teenagers become well rounded members of society. The habits developed at this stage carry over into adulthood. What kind of adult would you like to send out into the world?